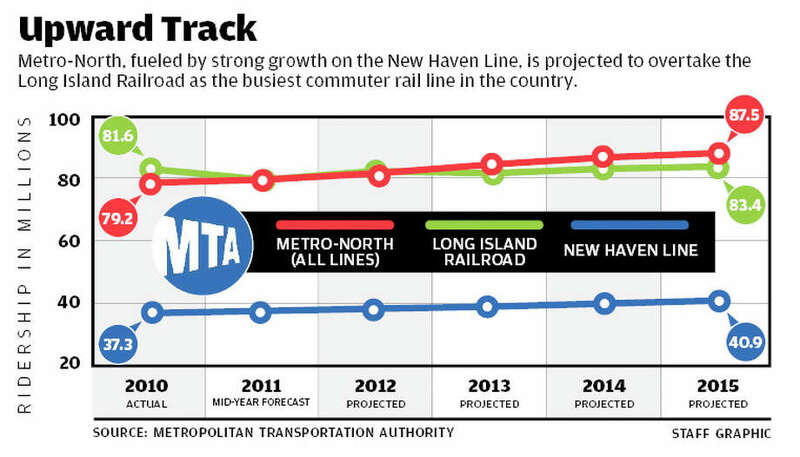 Metro-North, fueled by strong growth on the New Haven Line, is projected to overtake the Long Island Railroad as the busiest commuter rail line in the country. STAMFORD -- After more than three decades of gradual growth, Metro-North Railroad's total ridership is expected to surpass that of the Long Island Railroad in 2012 to become the nation's busiest rail line. "It's good news that as we improve commuter service with new cars and other improvements that ridership has gone up," said Joseph McGee, vice president of public policy for the Fairfield County Business Council. "It confirms the fact that if you invest in and improve rail transportation, people will ride trains." A higher than expected ridership growth of 2.1 percent on the New Haven Line from January through May helped Metro-North log 32.7 million passenger trips, beating Long Island Rail Road's total of 32.2 million trips during the same period, according to figures prepared for the Metropolitan Transportation Authority board in July. Long Island Railroad's 32.2 million trips represented a drop of 1.5 percent from the same period in 2010, according to the figures. Long Island Rail Road has long held the title as the busiest commuter rail line in North America. "Metro-North's consistent growth goes hand in hand with steady improvements in service, both in frequency, efficiency, and reliability," Metro-North spokeswoman Marjorie Anders said. "With an on-time performance of 98 percent, our customers know they can rely on Metro-North." Salvatore Arena, a spokesman for the Long Island Rail Road, said the decline in ridership is attributable to the lingering impact the Great Recession has had on employment on Long Island, service cuts to balance the MTA's budget, and various service interruptions caused by January's blizzard and a February ice storm. A fire on Aug. 23 in a switching tower in Jamaica, N.Y., halted almost all service for most of that day. "The poor economy and soft labor market are the main reason for the decline over the last two years," Arena said. "This year, several additional factors have contributed to the problem, including the blizzard in January, the ice storm in February, the Amtrak derailment in the East River Tunnel in May, as well the implementation of planned service reductions in an effort to balance the MTA's budget." In 2012, Metro-North predicts its three lines, the New Haven, Harlem and Hudson, will provide 81.9 million rides, beating out Long Island Rail Road's projected 81.5 million rides. 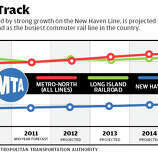 The New Haven Line is fueling much of the growth and is expected to provide a record 38.6 million rides in 2012, which is projected to swell to 40.9 million trips in 2015. The previous record was set in 2008, when the New Haven Line provided 38.2 million trips. In 2015, Metro-North expects to provide 87.4 million trips, compared to Long Island Rail Road's projected 83.4 million rides. Anders said in recent times, the New Haven Line's fastest growing customer groups are intrastate commuters who travel to employment hubs like Stamford and Greenwich, as well as reverse commuters who travel to Stamford and Greenwich from New York City. Arena said Long Island Rail Road does not have a similar group of commuters riding trains east to employment hubs in Long Island. "The New Haven Line is the busiest rail line in North America and has been leading the way in ridership growth partly because of the expansion of financial companies in cities like Stamford and Greenwich," Anders said. "These new employment centers have sparked growth in the intrastate and reverse commute markets." Connecticut Rail Commuter Council Chairman Jim Cameron said the projected ridership spikes highlight the need for the state Department of Transportation to address infrastructure needs, such as increasing parking at New Haven Line stations, extending platforms and signalizing the right of way to allow for faster service. The projections could be conservative if ridership is boosted by prolonged higher gasoline prices and if new hiring begins to build momentum, Cameron said. "We've got new cars that have slightly lower capacity, and, if the projections are for a serious increase in ridership, we still don't have all our stations with 10-car platforms," Cameron said. "There are a lot of things on the infrastructure side under DOT's responsibility that have to be addressed." McGee also said signalizing the New Haven Line and resulting shorter trip times would be a positive step toward moving to cities like Bridgeport. "If we improve signalization on the New Haven Line, we can increase significantly service levels and allow speeds to increase," McGee said. "If you can make it from Bridgeport to Manhattan in 55 minutes, that's a really big deal." State economists in Connecticut and New York said the slowing recovery from job losses from the 2008-09 recession make linking increased ridership with job growth difficult. Patrick Flaherty, an economist for the Connecticut Department of Labor, said a possible cause of long-term ridership gains might be shown by an analysis he recently completed, which indicated a rise in the number of residents in Connecticut's most populous cities working farther afield from those cities. Flaherty said an analysis of U.S. Census Bureau employment data from 2002 and 2009 showed 5,183 fewer people in Stamford and 3,903 fewer people in Bridgeport both lived and worked in the city, indicating people are traveling farther to find jobs. "Though it's hard to match specific industries to ridership, it seems that in this particular economy with severe high unemployment, people are looking for work farther away," Flaherty said. "It may be that people are just extending their search for where they are looking for work geographically." After Connecticut recovered 25,300 jobs last year of the 119,000 jobs it lost between the start of the recession and the end of the state's recession in January 2010, job growth has slowed, Flaherty said, with only 4,300 new jobs added so far in 2011. "We're still closer to the bottom than we are to being back to the previous peaks," Flaherty said. While the financial services and other white-collar fields have failed to restore jobs lost in the recession, New York City has seen a rebound in both the business and professional service, and the education and health job categories continue to grow from last year, said Elena Volovelsky, a senior economist for the New York State Department of Labor's Manhattan office. In New York City between July 2010 and July 2011, companies added 31,600 new health care and education jobs, including teachers and nurses, Volovelsky said. The level of employment and business and professional services in July 2011 stands at 605,200, not far behind the peak level of employment in that category in July 2008 of 611,300 jobs. "We're getting pretty close to the peak in that area," Volovelsky said. Volovelsky said the hard-hit financial service and real estate sector in New York City recovered a relatively paltry 4,100 jobs in 2011, a growth rate of just under 1 percent. Peak employment in financial and real estate jobs came in 2007 with 473,000 jobs, she said, but remained at 437,600 jobs as of July 2011. "We've seen a continuing trend of those jobs slowly declining that has been going on since the 1990s," Volovelsky said.